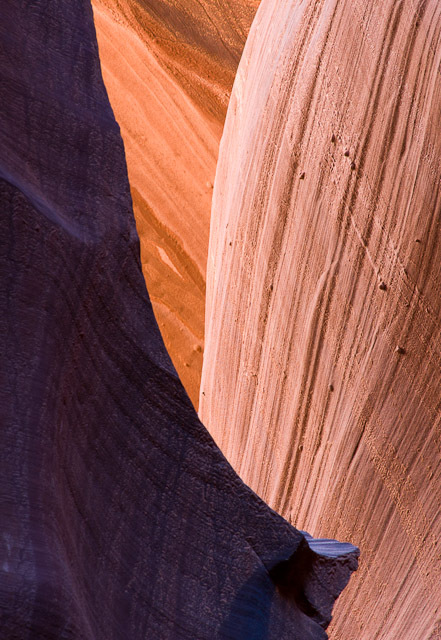 We took a road trip to Antelope Canyon during the photography workshop at Zion. Antelope Canyon is near Page, Arizona. Page is a little over a two hour drive from Zion. Antelope Canyon is a slot canyon. If I remember my facts right, it's about a quarter of a mile long. It's typically around 50-60 feet deep and is often less than 10 feet wide. Except for brief periods during the summer, the sun doesn't reach the floor of the canyon. But the sunlight does bounce around the canyon walls. This makes for some unique lighting conditions and creates amazing displays of light, shadow, and rock.